Our journey began full of anticipation and very quickly turned to travel aggravation. All you need to know, is that we endured hours of flight delays and frustrated reservation agents. But, we refused to let that deter us. We focused on the destination and not the roadblocks. After all, we were headed to an historic cottage on Lake Como, Italy for our 15th anniversary. 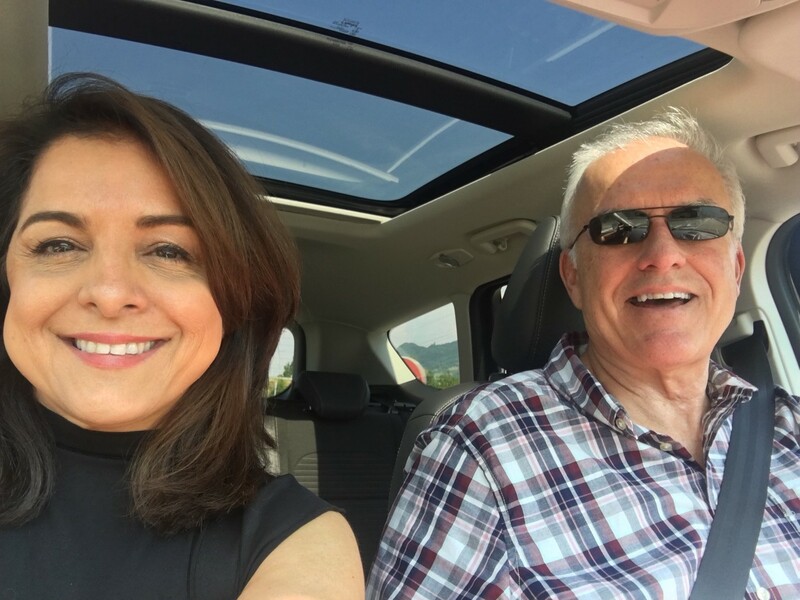 Fast forward 20 hours, our vehicle was upgraded by a couple of fun loving car rental agents in Lyon, France and before we knew it — — we were headed for the Alps. As Mount Blanc rose higher and higher ahead of us, we were in awe of the grandeur of the Alps. Quickly the scent of cattle from country farms in France gave way to the pine trees and alpine air of Switzerland. The majesty of Mount Blanc rose before us guiding us to a 7.5 kilometer tunnel which would drop us into the very northern reaches of Italy and the picturesque village of Courmayeur. There in Courmayeur, began our vacation. I ordered spaghetti and John a pizza and a half bottle wine. We were in no hurry now. The sheer nature and beauty of this alpine village swallowed us whole. We were sold. We raised a glass and gave thanks to a year full of challenge and heart ache, a year full of triumph and despair. Another year to remember that together we can make it through anything. I looked up and John had accidentally spilled his wine and was feeling sheepish — I wiped up the wine, poured him another glass and said we’re fine — it’s okay! This year has been less than perfect but it’s keeps building our character and has fostered resilience and creativity. At this point, we asked where we could find the best cheese and the waiter ushered us to walk 200 meters to the right to Panizzi, a quintessential farm to table market for local yogurt and cheeses. By the time we arrived in Lake Como, it was sundown but still light enough to know we had magically been embedded back to the 1600’s. We were to stay in a three-story cottage, made of stone and wood with a stunning image of the Madonna and child welcoming us at the entrance. The courtyard, centered around a Catholic Church for St. Francis of Assisi had little kids playing soccer. The Church bell reminded us that it was 7pm. Our first night in the ancient district of Molina was overwhelming with the sites and sounds of a powerful storm — lightning unlike anything we’ve ever heard, reverberating all around us as if to say — welcome visitors — I’m in charge of Antica Molina — the Piazza of Saint Antonio. We awoke to sound of the Church bells ringing — first an ode to the morning and then an aria to Salve Maria. And I mean a LOUD ode. We made Bellagio our first destination. After 50 minutes driving alongside the winding roads of Lake Como, passing a sea of humanity in one-lane passageways and ancient markers from the times of Julius Cesar, we made it to a quaint and stunning town. There we shopped for silk and lace. An exquisite linen lace for our daughter Samira’s wedding and an even more exotic red tie for Joseph’s wedding. Along the way, we picked up a postcard for our granddaughters Samantha and Ryan to mark this moment in time. The day was complete when John ordered fish and chips and much to our amazement they literally served up minnows! Davar Ardalan is the founder and storyteller in chief of IVOW, an AI-powered storytelling agency and Stanford Affiliate. Ardalan co-chairs the Stories and Audiences Committee of the VR/AR Association, and has been recognized with a 2017 NASA Team Leadership award for Space Apps, a Gracie Award from the American Women in Radio and Television and a shout-out in the popular comic strip Zippy. In May 2014, she was the recipient of an Ellis Island Medal of Honor, for individual achievement and for promoting cultural unity. An Untouched beauty .. Interlaken!